"There was a point to this story, but it has temporarily escaped the chronicler's mind"
It can't have escaped the attention of the more observant amongst you that I began both today's and yesterday's entries with a quote from Douglas Adams, specifically quotes from his magnum opus, the five-part Hitch-Hiker's Guide to the Galaxy trilogy. Those of you who know me won't be surprised; Douglas Adams's work has been a big influence not only on my own style of writing, but on my mode of speech, my way of thinking, and not to put too fine a point on it, my life. I suppose it can partly be put down to the age at which I became acquainted with it; when Hitch-Hiker's was first broadcast I was an impressionable thirteen year old and, thanks to almost constant self exposure to science fiction in general and Doctor Who in particular, a fledgling nerd. I was therefore gripped initially by the SF element of The Guide, but what has stayed with me ever since is the cynicism, satire and clever use of language. By the end of The Secondary Phase's first run on Radio Four I was hooked and even went so far as to write my own Tertiary Phase, some twenty plus years before the real thing was broadcast. Episode one of this was actually passed on to Douglas by my aunt at a party, but unfortunately he passed out drunk before being able to read it. Given all this back story, this blog entry is by necessity going to be a very personal view, and I reserve the right to be incorrect about any number of issues - it's all subjective. However, in cases of major discrepancy it's always reality that's got it wrong. I am by no means alone; many, many people love Douglas Adams's work in general and The Hitch-Hiker's Guide to the Galaxy in particular. I am sure some of them are far more obsessive than me. However, despite this I can't help thinking that some of them just don't "get it". Especially when they start banging on about towels all the time (Towel Day aside). "Mostly what I love are Douglas’s subtle word choices. He’s a wordsmith. There’s a line (I think this one is actually in RESTAURANT AT THE END OF THE UNIVERSE) that talks about someone being 'nibbled to death by an okapi'. I crack up every time I hear it. The word 'nibbled' is the first thing that gets me, and the fact that it is an okapi doing the nibbling is just icing on the cake." "Meanwhile, the Earthman Arthur Dent, to whom all this can be of only academic interest, as his only brother was long ago nibbled to death by an okapi, is about to be plunged into a real intergalactic war"
"Since John Lloyd nearly always beat me at Scrabble I reckoned he must know lots more words than me and asked him if he would collaborate with me on the last couple of scripts. 'Prehensile, 'anaconda' and 'ningi' are just three of the thousands of words I would never have thought of myself." I maintain that 'okapi' is another of those words. Incidentally, the line "nibbled to death by an okapi" was subsequently sampled by The Damned and appeared in the lead out groove of their 1979 LP Machine Gun Etiquette - I wonder if they paid royalties to Douglas Adams, John Lloyd or the BBC - or perhaps no-one, hoping they'd just get away with it? If John Lloyd subsequently reveals that in fact he didn't write that line, then I apologise unreservedly and withdraw the implication. I was delighted when I heard the news in 2004 that a third, fourth and fifth radio series was finally going to be made and on the whole I really enjoyed all three, and think that some of the plotting by Dirk Maggs to tie together some of the more disparate and contradictory elements of the canon was masterly. Zarniwoop = Van Harl? Genius. Secondary Phase being revealed to have taken place in the universe in Zarniwoop's office which doubles as the virtual environment from Mostly Harmless? Likewise. The more upbeat ending? Magnificent. However, I think that in a couple of places the adaptation just didn't "get it" either. One of the many wonderful things about the original show was The Book's narration. 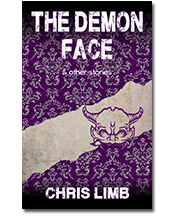 These passages were witty, intelligent and had a quiet authority that had you suspending all disbelief no matter how absurd the content. In all three new radio series the writers seemed afraid that we wouldn't be able to take it and insisted on dramatising little sequences in the middle of narrations - for example, the sequences involving the Silastic Armorfiends and Lallafa's Songs of the Long Land. That wasn't necessary. We can take it as narration, honestly! Finally, I would like to express my utter horror at something that is about to happen. On 12 October 2009. On that day the alleged sixth book in the Hitch-Hiker's sequence, And Another Thing... will be published, written by an author named Eoin Colfer. Now I've never read anything by him, and for all I know he's a genius - some people certainly speak very highly of his Artemis Fowl series of books. That is not the point. This is. 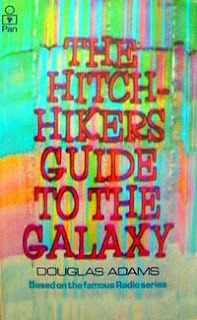 Hitch-Hikers = Douglas Adams. Sure the books were popular, but the author is dead. I really wish he wasn't, but he is. Picasso's paintings are still very popular, but it doesn't mean that they can commission another artist to produce more Picassos. What next, are they going to commission someone to write Hamlet 2? Don't be silly, of course I'm going to read it. Disunited States of Bohemia has moved!